Q: I got error message "Failed to query MX server of somedomain.com" when I was trying to send e-mail. Please use following dns server if your local DNS server can't work. One line per DNS. 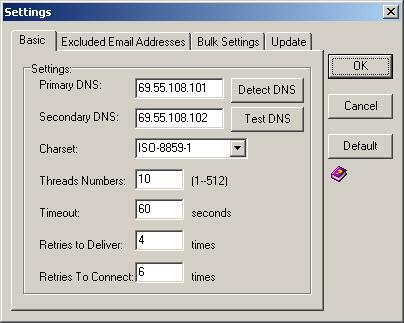 You can use copy paste to enter it into [Settings->DNS server] of our bulk email program. After entering, you may need to click [Settings->Test DNS] to make sure it work on your PC. And then, click [OK] to save settings.